Editor’s Note: This story was updated on Friday, Feb. 3, 2017. After Snapchat’s IPO filing, we now know that Snapchat stock will trade on the New York Stock Exchange under the symbol “SNAP.” We also learned that Snapchat has roughly 160 million daily active users (DAUs), and that Snapchat posted revenue of $404.5 million in 2016. The company also recorded a net loss of $514.6 million in 2016. Investors are anxiously waiting to invest in Snapchat stock, as the Snapchat IPO could be the biggest IPO since Alibaba in 2014. But before investing in any company, no matter how much hype surrounds the IPO, every investor needs to perform their due diligence. That's why we are providing Money Morning readers with a Snapchat stock guide consisting of the most common questions we've received ahead of the Snapchat IPO date. But we aren't just going to provide you details about Snapchat (now formally Snap Inc.). We are going to talk about whether or not Snapchat stock will be profitable. Snapchat is a mobile app that allows users to post videos and pictures of themselves. But instead of posting a plain video or picture, users can add captions and doodles. Users can also add animations and images to the picture. 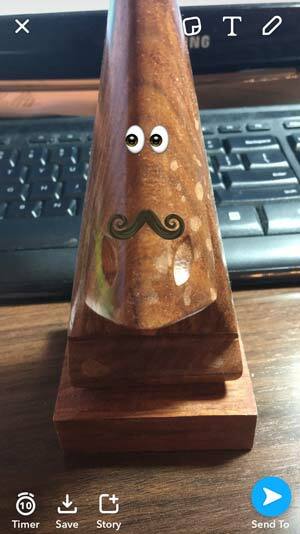 As an example, I used Snapchat's features to add eyes and a mustache to my Easter Island glasses holder. You can see that right here on the side. Snapchat is also unique because after a picture is viewed, it will disappear after 10 seconds. Pictures and videos on Facebook Inc. (Nasdaq: FB) are normally about what you have done, but Snapchat pictures and videos are focused on what you are currently doing. It's supposed to be a representation of what is happening right now, and then disappears just like a real moment. Snapchat users can also add pictures and videos as a "story," which can be viewed for 24 hours. Now that you know how it works, here's the most important question for Snapchat stock investors: How does Snapchat make money? 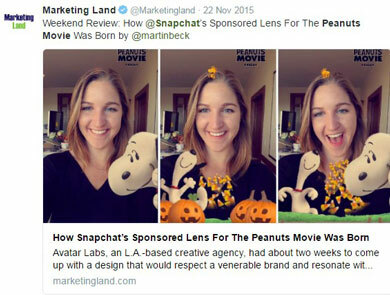 One of the ways Snapchat makes money is through its "Sponsored Lenses" feature, which was launched in October 2015. The lenses feature allows users to customize a video or picture of themselves with different animated filters. The first sponsor of lenses was 20th Century Fox. It allowed Snapchat users to take selfies with characters from "The Peanut Movie." Snapchat users could also add characters like Snoopy and Woodstock to their snaps. According to eMarketer projections, branded lenses and geo filters (an ad-like invitation that allows users to know when and where an event will be held) could generate $102 million in revenue by 2016. Those new features are great for Snapchat's growing revenue. But the most important revenue source for Snapchat stock owners will be advertising. Companies can buy ad space on Snapchat, and Snapchat provides a lot of additional features for ads. The ad will appear in the context of other snaps, and the advertiser has the option to direct ad viewers to more of its content. If the ad viewer swipes up on the ad to see more, advertisers can direct Snapchat users to articles, videos, app install ads, or a mobile website. According to Snapchat, the swipe-up rate for its Snap Ads are five times higher than the average click-through rate on comparable platforms. 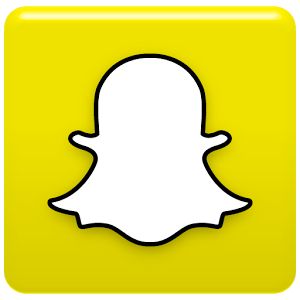 Revenue from video ads is expected to generate roughly $250 million in 2016 for Snapchat, according to eMarketer. Aside from selling ad space, Snapchat will also have a physical product to sell. On Sept. 23, Snapchat revealed a new product called "Spectacles." The Spectacles are sunglasses that record up to 10 seconds of video, and the video can be posted wirelessly to the Snapchat app. There's no official release date for Spectacles. But according to The Wall Street Journal, it should be released this fall. The glasses will retail at $129.99, but won't be a significant source of revenue right away. Spectacles, though, will give a Snapchat a unique edge over its competitors. But because some of Snapchat's competitors offer similar services, investors can be confused if Snapchat owns or is owned by another company. Are Snapchat and Instagram the Same Company? No, Instagram and Snapchat are not the same company, even though they have similar features. Instagram was created by Kevin Systrom and Mike Krieger and launched in October 2010. Facebook purchased Instagram in April 2012 for $1 billion in cash and stock. Snapchat was created by Evan Spiegel, Reggie Brown, and Booby Murphy when they were studying at Stanford. According to TechCrunch, Brown said he wished the photos he was sending a girl would disappear. When Spiegel heard about the comment, he allegedly said it was a "million-dollar idea." The trio began working on the idea in the spring of 2011 and called it "Picaboo." It launched in July 2011, but only had 127 users. There was internal conflict between Brown and Spiegel, and Spiegel and Murphy removed him from the company. They renamed it Snapchat in the fall of 2011. According to The Wall Street Journal, Spiegel received a $3 billion offer from Facebook in 2013. 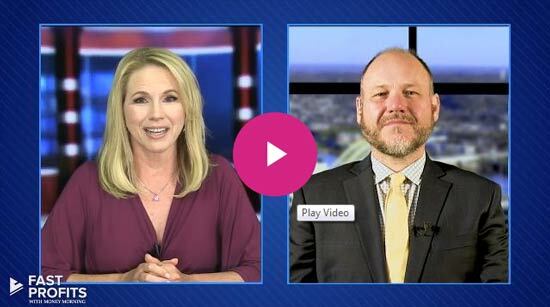 Before the imminent Snapchat IPO, I asked Money Moring Director of Tech & Venture Capital Research Michael A. Robinson if Facebook CEO Mark Zuckerberg would make another attempt at buying Snapchat. "As regards to a possible Facebook purchase, I think it would actually be a great fit specifically because of the new glasses that I think would be a good hardware lineup when you throw in Oculus," Robinson told me. "Same thing for Snap's TV plans. It's a great platform since millennials watch TV on their mobiles or laptops. Anything is possible in today's M&A market, but Facebook making an offer would be tough for Zuckerberg. He'd have to pay several times his earlier offer to induce the firm to change its mind, and I think Snap prefers to remain independent at this point, especially following the new glass and their plans for TV," Robinson said. Spiegel seems confident Snapchat could eventually be worth more than Zuckerberg's original offer. According to Bloomberg, Snapchat could be worth $25 billion. But how can a company with just $3.1 million in revenue from 2014 be valued so highly? The first reason is revenue growth. In 2015, Snapchat generated $59 million in revenue, according to Bloomberg estimates. That's an increase of 1,803% in just one year. 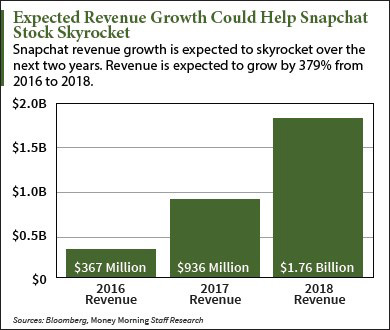 But Snapchat's projected revenue in 2018 is what really makes investors excited to buy Snapchat stock… By 2018, Bloomberg projects Snapchat will generate $1.76 billion in revenue. The revenue growth rate is impressive. It took Twitter Inc. (NYSE: TWTR) nine years to generate $2.22 billion in revenue. Snapchat could do it in six. The second reason is that Snapchat would be priced similarly to Facebook in terms of its estimated revenue for the following 12 months before its IPO. Facebook's shares were priced at 19 times its estimated revenue. With a $25 billion valuation and projected revenue of $1 billion, Snapchat stock could be priced at 25 times its 2017 revenue. For value investors, this will still seem like an overvalued company. But tech companies in general have high price/earnings ratios. For example, Facebook has a P/E ratio of 61.59, Amazon.com Inc. (Nasdaq: AMZN) has a P/E ratio of 203.65, and Netflix Inc. (Nasdaq: NFLX) has a P/E of 367.88. The third reason Snapchat could have a $25 billion valuation is Snapchat has one of the most sought after demographics on the internet for advertisers: teens and millennials. According to Bloomberg, 70% of 18 to 24-year-old Americans with smartphones use Snapchat. There is also growth in the 25 to 34-year-old age range. Only 6% of 25 to 34-year-olds used Snapchat as of June 2013. By June 2016, that number has climbed to 41%. Well-known companies and products like BMW, Gatorade, T-Mobile, Sony Pictures, and Under Armour Inc. (NYSE: UA) have all advertised on Snapchat to reach younger demographics. Snapchat currently has 235 million monthly active users (MAUs), and the average user is highly engaged with the app. Snapchat users spend nearly 10 minutes a day on the app, compared to Instagram's 6.4 minutes, according to equity investment company Cantor Fitzgerald. As Snapchat continues to grow its MAUs, companies will spend more and more on advertising to reach them. When Will Snapchat Go Public? On Oct. 6, 2015, The Wall Street Journal reported Snap Inc. was preparing paperwork for an IPO. The earliest Snapchat IPO date is reportedly March 2017. If the Snapchat IPO does happen in 2017, it will be the biggest company to go public on a U.S. stock exchange since Alibaba Group Holding Ltd. (NYSE: BABA) in 2014. But as WSJ reports, there is no guarantee there will be a Snapchat IPO in March, and it may not even happen in 2017. Snapchat may also not receive a valuation of $25 billion by the time it goes public. Right now, there is no Snapchat stock symbol. There is a company with a related name called Snap-on Inc. (NYSE: SNA), but the "SNAP" symbol isn't publicly traded on a major index. To keep its brand recognition, the company will most likely use SNAP or something closely related. Once Snapchat does pick an IPO date and a stock symbol, our readers have been asking what will be the Snapchat stock price? What Is the Snapchat Stock Price per Share? The Snapchat stock price has not been set. The IPO offering price is the price wealthy investors and large institutions pay for shares of the IPO before it trades to the public. For example, these wealthy individuals were able to buy shares of the tech company Twilio Inc. (NYSE: TWLO) for $15 before it was open to the public to invest on June 23. On June 23, the TWLO stock price opened at $23.99. It closed on June 23 at $28.79 per share. That was a profit of 20% in a day for most retail investors. But the big investors who bought in at $15 netted a gain of 91% in just one day. TWLO traded at an all-time high of $70.96 on Sept. 28. The TWLO stock price opened at $45.39 on Oct. 18, which means investors would be down 36% in less than a month if they bought TWLO stock at its height. But for the large investors who have just held on to their $15 TWLO shares, they are up 202%. When you first see the price of the Snapchat stock, it will be the price available to wealthy individuals and institutions. The actual price per share for Snapchat stock on the morning it trades to the public will be different. This leads us to the most importance question investors will ask themselves in 2017: "Should I buy Snapchat stock?" I like the presentation on Snapchat. I bought 200 shares of FB at $18.80 on that same day. Have bought a couple of weed stocks, looking for more. Thanks for reading Money Morning. For more on investing in marijuana stocks, take a look at this story. where do we go to buy the snapchat IPO and what is the minimum to invest? I understand but if you buy it early before it goes public you will make lots more money . so that is the service I am looking for before it goes public, not after. Unfortunately, retail investors generally aren't able to buy shares before a company goes public. It's the big banks and large institutions that always make the most money because they can buy in at the IPO offering price. For example, wealthy investors were able to buy shares in tech company Twilio for $15 before the public could buy shares. The first day the public could buy the stock, it opened at $23.99 per share. So those wealthy investors made profits of 59% in a matter of minutes. It's a good idea to try and get in before Snapchat stock is available to the public, but it's not possible for most investors. Hope that helps! I trade with Ameritrade but they did not reserve any SNAP stock for the public. I asked the following questions to the CS rep at Ameritrade but he said that, that information is not disclosed to them. Why do some trading companies offer certain IPOs and some don't? Also, before the IPO, will the public be able to see who the insider buyers are and how much SNAP stock they are buying? If so, where will it be posted? Normally, getting in on IPOs early are only for big banks and large institutions. So you may see things like wealthy investors getting in an IPO for $15, but it opens the day at $23.99 to the public, like with the IPO from tech company Twilio. Unfortunately, IPOs aren't set up for retail investors to quickly profit.